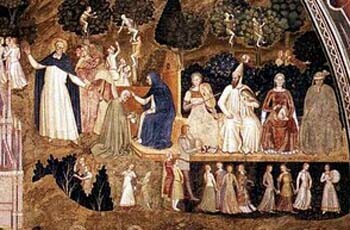 In the Middle Ages society was made up of the three orders, the clergy, the nobility and the people, each order having its responsibilities, privileges and special honors. In this tri-partite division, there were clear boundaries between those who governed and those who obeyed, as in any social group. Nonetheless, each of these three classes in its own way and degree participated in the government. I stress this because the revolutionary saga portrays the Middle Ages and the Ancien Regime differently. According to it, this period of History was dominated by an absolutism where only the King commanded, with no one else sharing his power or participating in his government in any way. This accusation is false. It would not even apply to the Czars of Russia, which was the type of government that came closest to this caricature. The only time this absolutism became a reality was under Communism. Then, yes, an ‘absolute monarchy’ was established in a way that easily led to abuses, excesses and exaggerations. But the Revolution does not accuse Communism of this. It saves this criticism for societies born under the influence of the Church from the beginning of the Middle Ages until the end of the Ancien Regime. Thus, it accuses medieval kingdoms of exercising an absolute monarchy that simply did not exist, and it is silent before the absolutism that actually existed in Communist Russia. What St. Thomas Aquinas recommends as a good form of government is a monarchy that includes the participation of all social classes: the clergy, the nobility and the people. How does the clergy, as a social class, participate in the government of the King? Today, given that the Church is separate from the State in almost all countries, it can be difficult to understand how the clergy can be referred to as the first class of society and as a powerful political class. The clergy is the first class of society because of its sacred character. Its members are the ones in charge of the worship of God and the preaching of the Gospel, the most elevated works that exist. The First Commandment clearly states that we should love God above all things. Thus, the class of men who guide and encourage this love in society is the first. By teaching Catholic Morals the clergy lays the very foundation of civilization. Without morals a country has no worth, and it is the Catholic clergy who have all the supernatural and natural means to inculcate authentic morals in a country. Since this is the highest and most fundamental mission, it is natural that the men entrusted with it should occupy the first place in society. The second place belongs to the nobility. Again the revolutionary saga presents this class as one teeming with vanity, self-infatuated, drunk on its own grandeur, jealous of its privileges and forbidding anyone to be above it. This is a ridiculous accusation. The nobility as a class was never like this either in the Middle Ages or later. On the contrary, as we just said, the first class – above the nobility – was the clergy. 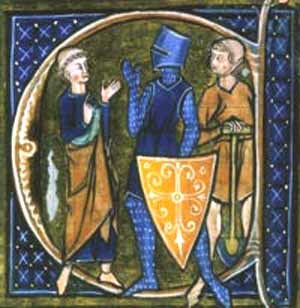 The nobility was quite aware that it was the second class. At meetings, social events, official ceremonies, the order that had the first places of honor was the clergy. And the clergy was made up not only of the sons of the nobility but also the sons of the people, according to the vocation God had given each one. In the Church, what counted was the place a man had in the ecclesiastical hierarchy, not the social rank in which he was born. I emphasize these principles to counter the wrong ideas the Revolution spread about the social regimes that existed before the French Revolution. 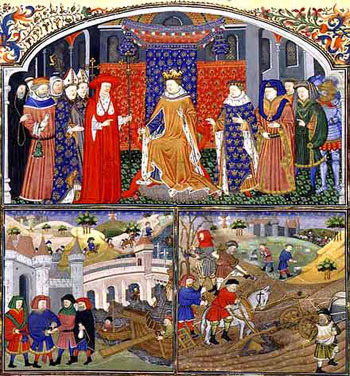 Both the clergy and nobility participated in the government of the country in many ways. Both groups had countless fiefs where they exercised a strong influence. Yes, even the clergy had temporal fiefs: At times, a parish would have a large property; at times an abbey or a convent controlled a large fief in this or that region of the country. As examples we have the Bishops of Cologne and Geneva who were at the same time temporal Princes governing large amount of lands. One of the Bishops of Geneva was the suave St. Francis of Sales, known for his sweetness. By ruling over the small matters that made up part of day-to-day life, these lords represented for the little people the King, whom the people would see rarely. Therefore, in reality those temporal lords – nobles or clergymen – were the longa manus [long arm] of the King. The nobility’s influence was also great because all the military power belonged to it. The whole military was under the King, it is true, but the great majority of the commanders were nobles. It was rare for a plebeian to enter the army as an officer. At times a commoner who carried out great feats and became a hero would be made a noble and then would share in the command. The power of the military is obvious. We often do not notice it when times are peaceful, but it takes on relevance and becomes decisive in times of unrest or war. To the nobility fell the defense of the country in face of external aggressions as well as the maintenance of the social and political order of their fiefs. Normally the nobles also assumed the functions of what today would be a governor, mayor, chamber president, judge and police chief. He would exercise all of these functions without any expense for the Crown. As we see, these two orders – the clergy and the nobility – were turned toward serving the common good. To compensate them for that great burden, they were exempt from taxes. The people exercised their influence through the guilds. The workers’ guilds had their own laws, special privileges and, at times, even their own tribunals, governed by men from their own ranks who were independent from the functionaries of the King, the nobles or the city. Many times these guilds constituted small self-governing bourgeois republics inside the monarchy. The people were the class turned toward the work of production. They had the privilege of either not participating in war or doing so in a much smaller way than the nobility. The people usually had the exclusive rights over the most profitable professions in industry and commerce. How did they participate in the dangers of the war? If they desired, they could go to battle, but they would be paid well by the King for their service. 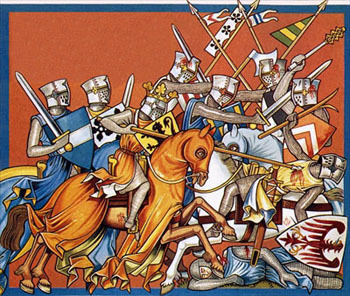 For many the war was a chance to make money and an opportunity to do heroic deeds and rise to the nobility. It was their possibility to have another career different from the normal country or city traditions. Therefore, many wanted to go to war, but it was a voluntary participation, different from the nobility who had the obligation to do so. Normally, the members of the third order, the people, did not have any special obligation to the State. They worked for the common good insofar as they served their own individual and family interests. They enjoyed many honors and privileges that they guarded carefully. Their principal onus as a class was to pay taxes. There was a medieval saying: “The wool has to come from the sheep.” Since the people – the bourgeoisie and plebeians – were the ones who received the advantages that came from profitable jobs, the responsibility of paying taxes rightly fell on them. The equilibrium of these diverse autonomous groups used to bring a great harmony to the nation with this kind of participative government. As we have seen, the Church and the State are both perfect societies, distinct from each other and sovereign in their respective fields: the Church in the spiritual sphere, the State in the temporal sphere. This distinction, however, did not prevent the clergy from having a participation in the temporal government. It was common for members of the clergy to become counselors of the King or the noble, and, through this influence, share in the temporal power. We have already discussed the Bishops and Abbots who actually had temporal power, which is another way for the clergy to share in the government of the King. This harmonic division – the clergy, the nobility and the people – reminds us of the representative assemblies that characterized the life of many monarchies of the feudal period and Ancien Regime, such as the Cortes in Portugal and Spain, the Estates General in France, and the Parliament in England. In those assemblies there was an authentic national representation that faithfully mirrored an organic society. With the Enlightenment, a revolutionary political philosophy was adopted by many leaders of European countries. Then, under the influence of a wrongly-understood notion of liberty, the Old World started on the path that would destroy the intermediary bodies of society, make a complete laicization of the State and establish inorganic assemblies composed of members chosen on a merely quantitative criteria of representation, the number of ballots in a box.